The global collapsible metal tubes market was valued at US$ 1,069.4 Mn in 2016 and is expected to be valued at US$ 1,550.8 Mn in 2025. The market is characterized by growing demand of collapsible metal tubes owing to their wide-spread usage in pharmaceutical and cosmetics industry. The global collapsible metal tubes market is expected to expand at a CAGR of 4.3% in terms of market value during the forecast period, 2017-2025. Consumer demand is rising due to intolerance towards plastic and plastic packaging. The market is also marked with the advancement in the manufacturing technology. The manufacturers of collapsible metal tubes around the world have also experienced the rise in demand owing to their superior barrier properties and extended shelf life they provide to the contents. Manufacturers are observed to focus more on expanding production capacity to meet soaring demand. The global revenues will be predominantly driven by the pharmaceutical sector. Key market characteristics observed in the global market for collapsible metal tubes include high demand for private label brands and various expansion activities by key players of the collapsible metal tubes market. The demand for high capacity collapsible metal tubes production lines is also rising. The market volume is expected to expand 1.4X during the forecast period 2017-2025. Transparency Market Research, in its report titled, “Collapsible Metal Tubes: Global Industry Analysis, Size, Share, Growth, Trends and Forecast, 2017-2025,” has segmented the global collapsible metal tubes market by product type, closure type, capacity, end-use, and geographic regions. On the basis of product type, the global collapsible metal tubes market is segmented into squeeze tube, twist tube, and others. The squeeze tube is the leading segment with a market share of over half of the global market. ‘Others’ segment is the fastest growing segment due to a high scope of innovative packaging and rapidly increasing consumer preference for metal tubes. The twist tube segment contributes only one-fifth to the market globally. On the basis of closure type, the market is segmented into stand up cap, nozzle cap, fez cap, flip top cap, and others. The stand up cap is the leading segment with the market share of around one third of the total market. ‘Others’ will be the fastest growing segment. Based on capacity, the market is segmented into less than 20ml, 20 to 100ml, and more than 100ml. Less than 20ml is the dominant segment while more than 100ml is the fastest growing segment. On the basis of end-use, the market is segmented into cosmetics, home care & personal care, industrial, pharmaceutical, food, and others. Pharmaceutical segment is the most dominant segment with over half the share of the global market. Food and ‘others’ will represent the fastest growing segments. The global collapsible metal tubes market is segmented geographically into five key regions including North America, Latin America, Europe, Middle East and Africa (MEA) and Asia Pacific (APAC). While APAC will remain dominant over others, Europe and North America will also maintain the key market positions with considerable market value shares over the forecast period. Some of the players operating in the global collapsible metal tubes market include Montebello Packaging, Auber Packaging Co., Ltd., Andpak Inc., Adelphi Healthcare Packaging, Linhardt GmbH & Co. KG, CONSTRUCT Packaging, SUBNIL Packaging Machineries (P) Ltd., Universal Metal Products, Antilla Propack, Essel Propack Limited, Albéa S.A., PAKET CORPORATION, D.N.Industries, ALLTUB Group, Perfect Containers Pvt. Ltd., Hubei Xin Ji Pharmaceutical Packaging Co., Ltd., Jiujiang Deshun Adhesives Co., Ltd., PIONEER GROUP, IMPACT INTERNATIONAL and Almin Extrusion. Transparency Market Research examines the global collapsible metal tubes market for the forecast period 2017-2025. The primary objective of the report is to identify opportunities in the market and present updates as well as insights pertaining to various segments of the global collapsible metal tubes market. 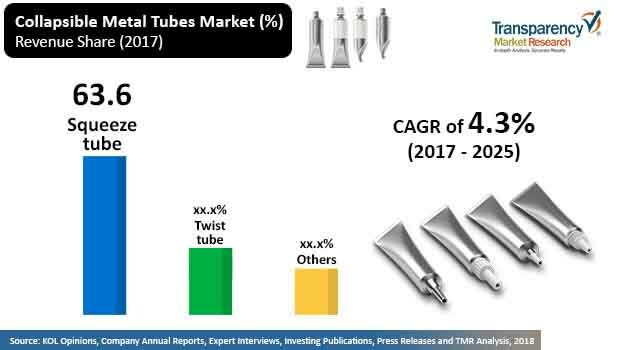 The report begins with an overview of the global collapsible metal tubes market, evaluating market performance in terms of revenue and volume, followed by TMR’s analysis of key trends, drivers, and restraints witnessed in the global market. Impact analysis of the key growth drivers and restraints based on the weighted average model is also included in the report. To compute the market size, in-depth secondary research is done. Data points such as regional splits and market split by product type has been assimilated to arrive at appropriate market estimates. The report comprises the forecast of the global revenue generated by the business in collapsible metal tubes market. TMR triangulates the data via different analysis based on supply side, demand side as well as the dynamics of collapsible metal tubes market. TMR not only conducts forecasts in terms of value, but also evaluate the market on the basis of essential parameters, such as Year-on-Year (Y-o-Y) growth. This helps providers to recognize the future opportunities as well predictability of the market. In order to understand and assess opportunities in this market, the report is categorically divided into five key sections on the basis of product type, closure type, capacity type, end-use and region. The report analyses the global collapsible metal tubes market in terms of value (US$ Mn) and volume (Mn Units). A vital feature of this report is the analysis of the collapsible metal tubes market by region, product type, closure type, capacity type and end-use; and the corresponding revenue forecast in terms of incremental dollar opportunity. This is traditionally overlooked while forecasting the market. However, incremental dollar opportunity is critical in assessing the level of opportunity that a provider can look to achieve as well as to identify potential resources from sales perspective of the global collapsible metal tubes market. To understand key segments in terms of their growth and performance in the collapsible metal tubes market, Transparency Market Research has developed a market attractiveness index. The resulting index should help providers identify existing market opportunities in the global collapsible metal tubes market. In the final section of the report, collapsible metal tubes market competitive landscape is included to provide a dashboard view of companies that manufacture collapsible metal tubes. The report contains company profiles of some of the players in the global collapsible metal tubes market. Some of the players operating in the global collapsible metal tubes market include Montebello Packaging, Auber Packaging Co., Ltd., Andpak Inc., Adelphi Healthcare Packaging, Linhardt GmbH & Co. KG, CONSTRUCT Packaging, SUBNIL Packaging Machineries (P) Ltd., Universal Metal Products, Antilla Propack, Essel Propack Limited, Albéa S.A., PAKET CORPORATION, D.N.Industries, ALLTUB Group, Perfect Containers Pvt. Ltd., Hubei Xin Ji Pharmaceutical Packaging Co., Ltd., Jiujiang Deshun Adhesives Co., Ltd., PIONEER GROUP, IMPACT INTERNATIONAL, and Almin Extrusion.